Beyond the glittering black buildings that had surrounded Mhumhi in the alleyway, there was a vast field. At least, he thought it was a field. He had never seen one before in his life. But it looked like a field should- it was flat and open, very dusty-looking, and covered with scrubby-looking yellowed grass that waved gently in the wind. Mhumhi had never seen grass before, either. He had to stare at it for a long time before he could really comprehend it. As he did, he suddenly realized where he was. This was a park- the park. Big Park. As this realization slowly came to him, he suddenly heard a great deal of whining and chattering. Bounding high over the tall grass was a very large group of painted dogs, all sun-splashed pelts and white-flagged tails held high. The one in front saw Mhumhi and stopped short. The others brought up a storm of chattering behind him, and suddenly Mhumhi found himself surrounded by them; at least ten, all sniffing and whining and nipping at him. Automatically he cringed, caught in the painted maelstrom, flattening his ears and wagging his tail down by his flanks. “Ligwami, look at his leg!” said another, and suddenly the flurry of them were concentrating on that side of his body, all clucking and chattering sympathetically. Mhumhi felt far too dizzy and overwhelmed to talk; he merely kept his head down and kept wagging his tail. “Give him some room to breathe, back up, can’t you see he’s had a bad time?” said Ligwami, turning to scold the others. Mhumhi realized that more were still arriving, crowding at the edge of the field, leaping up in place to be able to see. He was very certain he’d be ripped to pieces any minute. “He doesn’t really look like a puppy; don’t baby him, Nzui,” said Ligwami, tail going a touch stiff, but the female named Nzui was leaning down to lick Mhumhi’s forehead. “Let’s go back to the center track and look for your pack,” said Nzui, nudging at him. Mhumhi swallowed. “All right,” he said, seemingly to the delight of the whole pack of them, for they cheered and chattered and ran around as he slowly got back to his feet and limped forward between Ligwami and Nzui. 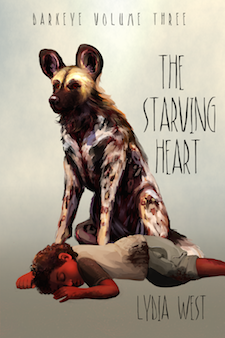 Mhumhi’s heart was beating at a fevered pace, but the painted dogs all seemed friendly, to a fault even, as each one of them tried to introduce himself to him all at once. Mhumhi let the names wash over him, hardly able to keep track as they bounded all around in the grass. “And what’s your name, pup?” asked Ligwami, when there was a long enough pause. “What are you whispering to the puppy?” Ligwami said loudly. Mhumhi realized what they were indicating: ahead of them the field was cut apart by a circular track of white gravel, absolutely covered with at least a hundred different painted dogs. In the center of it all was a very odd structure, sort of a crisscrossing mass of thick wire, spun into bizarre shapes and spheres. One side was blocked with a large, flat piece of wood, which looked very out of place. For a second Mhumhi thought he saw a flicker of movement within the structure, but the wires were too dense to tell. He took his eyes away and pretended to scan the mass of dogs, all shifting and milling and chattering away with one another. He’d never seen such a gathering of large dogs before- he wondered if this was all the painted dogs in the entire city, massed up together. “I don’t see them anywhere,” he said, intentionally putting his ears back and tucking his tail. “Oh,” said Nzui, sympathetically, though Ligwami gave kind of an impatient huff. Mhumhi said nothing, and luckily they didn’t notice his fearful look, for they had gotten slightly distracted with one another, sniffing and half-nuzzling, stealing guilty glances towards their conjoined pack members. Mhumhi looked at the vast swarm of painted dogs all around him, making a massive chirping, chattering din like a thousand birds, and wondered how on earth he was going to get himself out of this. He spared a thought for poor Maha, waiting down for him under the grate; she might have to wait a very long time. If the sun went down and he hadn’t returned, would she assume he’d been killed and leave? Would he, in fact, be killed? He was working himself up into a decent amount of panic, so it was a good thing he didn’t have much time to think about it. The yammering crowd was starting to get quieter, heads turning upwards. Mhumhi followed their gazes and saw that three dogs had climbed up onto the strange metal structure, where the wires came out and formed a sort of platform. There was a rousing, cheery chorus of agreement; painted dogs were leaping and twisting with excitement all throughout the crowd. Nzui and Ligwami hopped and chattered together; their packs swirled around them in a frenzy of excitement, some of them actually mounting one another in their eagerness. “All right!” called the dog on the platform. “You all know the rules- let them get past the trees, then you can start. And that’s all!” She bounded to her feet, throwing her head back. At once there was a loud clatter, and Mhumhi turned to see that a group of dogs had pushed over the piece of wood that had been sitting outside the structure. It had been covering a large hole, and within Mhumhi could see four hulkers, all cringing together in a huddle. They had none of the coverings that Tareq and Maha wore; they were just masses of furless, exposed skin. Mhumhi thought of the naked rats. He was getting a horrible sinking feeling. He had not understood what the dogs had meant when they had kept using the words ‘run’ and ‘hunt.’ But now he did. He had somehow stumbled onto a hulker hunt in Big Park- a hunt for live hulkers. The dogs around the structure were chattering and whining and biting at the hulkers through the wires. The hulkers all seemed reluctant to approach the hole, and Mhumhi didn’t blame them. They all looked horribly vulnerable. One looked rather young, and small- not as small as Maha, but nearly. It was also a female. One of the painted dogs jumped forward into the cagelike structure and dove towards the littlest one. The hulkers howled and scattered, bursting out the front, running full-tilt through the crowd of dogs, which parted way, some snapping. Mhumhi had never seen anything run like those hulkers, on their two long legs- muscles straining, limbs flying, they ran and scattered apart in the grass, though they left broad flattened trails as they did. They seemed to go in all different directions. Mhumhi saw Nzui and Ligwami putting their heads together, conferring; they seemed to be reaching a decision. Nzui and Ligwami wagged their tails, looking out across the field. Most of the hulkers had already vanished beyond the long grass, but perhaps they were visible from the platform, because the other dogs up there seemed to be looking out intently at something. She did not wait for Mhumhi’s reply; she turned back to Ligwami, quivering with excitement. The dog she’d named as Umenzi gave Mhumhi a friendly nudge. “You may go!” cried the dog on the platform, and Ligwami and Nzui burst together in a frenetic run, dashing forward across the gravel and into the grass. A good portion of the pack followed, ears slicked back for speed, and they vanished in an instant. “Come on,” said Umenzi, wagging his tail high, and trotted into the grass at a far more sedate pace. The six dogs left behind and Mhumhi followed him. The grass tickled against Mhumhi’s chin and stomach as they moved, trotting mostly silently. Some were sniffing a bit, but they didn’t seem terribly concerned about it, just kept their ears focused forward. Mhumhi was unsure of what he was supposed to do, so he merely followed them, exaggerating his limp. Umenzi drifted back towards him. Mhumhi said nothing, but Umenzi didn’t seem to need anyone else to hold up the other end of the conversation. He kept chattering away. The assembled dogs all exchanged looks, tongues hanging out and tails wagging. Umenzi nudged Mhumhi playfully in the shoulder. “No,” Mhumhi said, very truthfully. The dogs around him whuffed with laughter. Umenzi led them up a bit further, zigzagging briefly across one of the flattened trails the hulkers had left behind, and then stopped them beside some tall, naked, dead-looking things that smelled like wood- tree trunks, Mhumhi was to discover. The dogs did as he said, keeping their profiles low, spreading out in near-silence within the rustling grass. Mhumhi found himself suddenly isolated, the other dogs blocked from view. He could leave now, he realized. He could run off and they’d probably be none the wiser- if they caught him at it he could just say he’d gotten turned around and lost in the confusing tall mess, he could even try to disrupt their hunt and make it look like an accident. There was no reason for him to witness what was about to happen. Mhumhi thought this, and knew that he’d have to move, but he stayed still, stayed crouched low in the grass. His mind was roving, thinking of Maha, her impish grin, those pink babies she’d crushed with her teeth; the little naked hulker girl, running, her two legs pumping; the hulker dragging the dead coyote with its head smashed in, and the vision of it crouching and glutting itself on its insides; the hyena lifting up Sacha’s body by the head, her legs whirring; the crunch of the little rat’s head disappearing between Maha’s teeth. There came a dull pounding noise from far away. Mhumhi wasn’t sure if it wasn’t his own heartbeat. He looked around himself at the shifting, whispering grasses, obscuring everything from view. Anything could come out at him. The pounding was definitely getting closer. It was not his heart. It was the sound of flat, heavy hulker paws crushing the grass as it ran. Umenzi burst out of the grass beside Mhumhi, his companions following suit, as the hulker’s footfalls approached them- Mhumhi heard him slip, caught a glimpse of his naked back as he turned around- and suddenly they were all surrounding him. The hulker was trampling the grass flat around itself as it spun and spun, looking for a way out, but the twenty or so dogs of Nzui’s and Ligwami’s combined packs were whirling all around him, bounding through the grass, chattering and cheering openly now. The hulker was caught. Mhumhi saw his white-ringed eyes rolling, his flat teeth bared. The dogs ran around and around him, shifting between one another and changing direction like fluid, but none attacked him directly yet. He was holding a large branch with both hands, and he swung it wildly at the dogs each time they got too close. Mhumhi had not joined in the circle- he merely stood back and away, watching. He could still run away, he knew. The man shook his branch and howled, his voice loud and booming. He swung the branch again, though it did not contact any of the dogs- they leapt away too quickly. The man’s roving eyes darted madly around the circle, and then suddenly they caught on Mhumhi. And they stayed. Mhumhi was petrified. The man stared at him, his mouth open, his chest heaving, clutching his branch to himself. Mhumhi could only stare back. It seemed like longer, but it must have only been an instant, because the man yelled and swung his branch down again, turning. His calf was bleeding bright red and a dog was leaping back with blood shining on his nose. The man screamed again a moment later- another dog had caught his leg on the other side, tugging viciously at a mouthful of skin. The man raised his branch but another two dogs grabbed the branched ends of it in their mouths, holding it. A fourth dog ran to sink his teeth in the man’s other leg. The hulker screamed and screamed, tugging at his branch, his eyes wild- Mhumhi wanted to shut his ears, because the hulker was not angry, he was just scared, just scared now, so scared- A dog caught on his knee, and another on the inside of his thigh, as they swarmed up at him like ants, dragging him down- One caught him by his wrist and with a sob he fell. They tugged him taut by his wrist and his legs, stretching him as he writhed and struggled with the branch still in his hand dragging against the grass. His chest and belly lay exposed and naked before them. “Mhumhi,” said a dog, and with a start Mhumhi realized it was Umenzi, leaping to him, smiling broadly with his tongue hanging out. He fell into a brief play-bow, wagging his tail. Mhumhi said nothing- he could say nothing- and looked at the hulker’s face. He was crying like Tareq, wetly, whimpered utterances coming from him as he cringed and turned his face away. “Come on, Mhumhi,” said Umenzi, his grin fading somewhat, and when Mhumhi stayed stock-still he glanced at his brethren in bewilderment. “Come on, Mhumhi, he can’t hurt you, look,” said Umenzi, and he sprang forward and tore open the man’s belly. Mhumhi did not understand why the man did not scream them, for he was still alive. He stayed alive. The dogs ran forward, tearing at him, tearing at his skin and muscles and vital organs, all tugging in different directions- Nzui took a piece of skin at his flank and pulled too hard, exposing a stripe of white-red muscle, flaying him- and Umenzi was in the man’s belly, his whole head, and Mhumhi caught the awful stench as the bowels ripped. The man opened his eyes and looked at Mhumhi. His expression was dull and strange, as the dog just behind his head jumped forward and tore off his ear. His torso jerked as Umenzi leaned further inside and ripped away at something. And suddenly Mhumhi found himself headfirst in the hulker’s chest cavity, jostling for space beside Umenzi and another dog as they tugged and ripped. It was drier than he had thought- there was merely exposed red everywhere, all around, coils of intestines in Umenzi’s mouth, fat ugly globs, a dull thudding and thumping sound- Mhumhi bumped his head on something hard and turned it slightly. It was the hulker’s ribcage. He could hear his beating heart. Mhumhi seemed to lose himself for a moment. He did not lose his memory, nor his sanity, he merely lost his understanding. He opened his mouth and it filled with meat. It was like nothing he had eaten before, for it was, hot, alive, pumping- it filled his mouth with softness and wetness and his mind with hunger. He ate and ate, feeling the hulker’s insides and the other dogs pressing all around him- he ate and ate and tore and ate. At some point the hulker died. Mhumhi was not witness to when, but he knew it was before he had finished eating, for the man’s heart was not beating when he swallowed it. When he realized that, Mhumhi backed away from the crowd. More dogs jostled to fill the space he had left. They were all silent now, in contrasts to their chatters and cheers before; the only noises were those of eating, of bones cracking. Mhumhi’s stomach felt warm and full, fuller than it had ever been. The hulkers’s heart was inside him. Mhumhi had seen him alive, and looked in his eyes, and his heart was inside him. Mhumhi backed away further, turned, and ran through the tall grass, heedless of his injured leg and his heavy, swaying stomach. The grass seemed endless. Mhumhi quickly got lost, but it did not matter. He just needed to be away. His paws thudded beneath him, his mouth open, panting- his heart was beating so fast- was it his heart, or the hulker’s heart? Was the hulker’s heart still beating inside him, thudding, like it had when Mhumhi had put his head inside his chest? He nearly ran into a tree, but swerved just in time, skidding to a stop. There was something there, on the tree. Flies buzzing, a strange scent. He had no comprehension of what he saw for a moment, then he understood. There was a hulker hanging from the tree, dead. The branch had cracked slightly, and her legs trailed against the ground. Mhumhi wondered how she had gotten up there. On the other side of the tree’s base he could see another hulker- oh, he recognized her, it was the little hulker girl. She was dead too. There were harsh marks around her neck. Her eyes were closed, her face calm. The strange new part of Mhumhi thought, Meat. Mhumhi turned and kept running, running and running, until he saw the tall curved black building rising in the distance through the grass. He ran towards it gratefully, out of the bloody grass, back onto the concrete, back into the world of metal and glass and processed, bloodless meat. He found himself scratching at the metal grate before he really knew it, pawing at it with a kind of desperation. Maha’s face appeared beneath him, looking up. He backed away from the grate, away and away. He heard her climbing up the pile of trash, saw her small fingers curling around the metal as she moved it aside for him. Mhumhi stared at her, not understanding, then slowly came into awareness: his face was coated with blood, his fur slicked back and reddened with it. “Mhumhi, say something,” said Maha. She sounded frightened. Mhumhi stared. Maha furrowed her brow. Maha did start crying, sniffling, wiping her nose with her foreleg, and the sounds made him feel sick. He jumped into the storm drain, shoving her aside, and ran down the tunnel. Well, they seem like a cheerful lot. Yup… cheerfully running down and eating people. So cheery! ah, the ethical conflicts of eating meat… poor Mhumhi doesn’t even know that vegetarianism is an option. “the very soft footfalls of the back running towards them,” of the pack? “The man shook his branch and howled,” Why the switch from hulker to man? Well no need to take it out on Maha, Mhumhi.